The flagship Android segment has always been a battlefield but you wouldn't want to be around when these two are in their most violent mood. 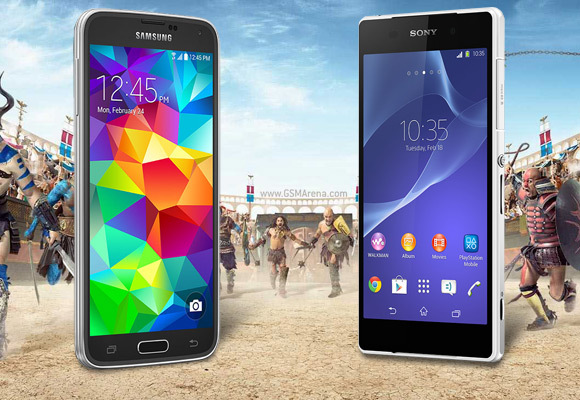 The Samsung Galaxy S5 and Sony Xperia Z2 are two of the most advanced smartphones to ever sit on a store shelf. Both make big claims regarding screens and cameras (staples for both companies) and brag about practically each of their features. And to say that it's a long list would be a massive understatement. 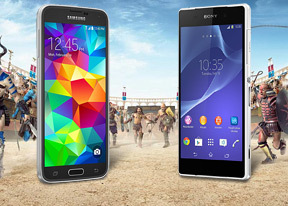 Samsung is in its prime, in large part due to the enormous commercial success of its phones. Sony is ailing and cutting off businesses to focus more tightly on its core competencies, especially smartphones. The outcome of this matchup will have a great impact on the fates of the two tech giants. Here's a quick blow by blow of where each phone bests its opponent. Keep in mind those differences are on paper only and the advantage might shift from one side to the other in the actual tests. Slightly bigger screen - 5.2" vs. 5.1"
Sony and Samsung are competing in the camera market - from point-and-shoot through mirrorless to DSLR - so of course they put their own sensors in their flagship phones. Smartphones have been outselling traditional cameras for years now. The two companies are also among the biggest TV makers and some of the biggest display makers for screens big and small. You can bet your bottom dollar their flagship phones are going to serve as a promotion of the two respective screen business. Sony made water resistance a trademark for the flagship Xperia devices, but this year Samsung jumped on it too after dabbling with Xcover and Active devices. One way or another, flagship smartphones have become the calling cards, pocket-sized posters of the companies that make them. With good reason too, no other digital segment sells in the hundreds of millions units and keeps growing year after year. In fact, cameras, TVs even computers are in decline. So it should come as no surprise that the two tech giants are putting on their Sunday best for the two flagships - that means the best screen, camera, chipset and other goodies they could get their hands on, plus the best design they could dream up.